An Australian MP is already under fire just after giving his maiden speech in parliament on Tuesday where he used the words "final solution" in reference to Muslim immigration. Senator Fraser Anning of the right-wing Katter's Australian Party (KAP) raised a firestorm of controversy with the speech that attempted to give voice to Australia's rising anti-immigration sentiment, telling lawmakers that Muslim Australians do not integrate well while bringing the threat of terrorism and further that they "do not work and live on welfare". Multiple fellow MPs as well as national television pundits have focused on what could be Anning's either unintended poor word choice or, as his accusers suggest, an purposeful attempt to evoke holocaust imagery. The final solution to the immigration problem is, of course, a popular vote. We don't need a plebiscite to cut immigration numbers; we just need a government that is willing to institute a sustainable population policy. The speech was immediately condemned as anti-semitic and Islamophobic, with One Nation party MP Pauline Hanson, slamming it as reminiscent of Nazi propaganda, among other lawmakers. "The Senator's use of the term 'final solution'...is a phrase torn from the darkest pages of human history." Later in the day Tuesday, WA Labor MP Anne Aly got emotional during her response to Anning's immigration comments, telling parliament, “I’m tired of fighting. I’m tired of having to stand up against hate, against vilification, time and time again," while wiping tears from her eyes. 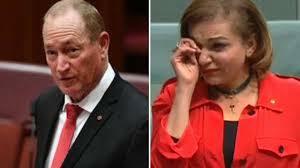 Aly, herself Egyptian-born and the first Muslim woman to be a member of the Australian House of Representatives, has in the past been targeted by Anning's political speeches. During his Tuesday maiden speech Sen. Anning specifically called for a complete ban on Muslim immigration, and outlined a plan for Australians to hold a popular vote on which nationalities and immigrant demographics should be allowed into the country. Australian media praised Aly's speech, saying a united parliament stood behind her, while generally casting Anning's speech as a throwback to the 'White Australia policy' — a set of historical laws that effectively barred people of non-European descent from settling in the country — which ended through a bi-partisan law passed in the early 1970s. Other government officials issued formal statements before parliament. Senator Hanson told lawmakers on Wednesday: "I am appalled by Fraser Anning's speech. We are a multiracial society and I've always advocated you do not have to be white to be Australian." Anning for his part, denied that his phrasing was a reference to the Holocaust and refused to apology even amidst an avalanche of criticism. “I don't regret anything. I am not going to apologize or regret anything that I say,” he said. His office denied that "final solution" had any deeper sinister meaning, saying the senator could as easily have said "last" or "ultimate". Katter's Australian Party's leadership has stood behind Anning: "Absolutely, 1000 per cent I support everything he said," party boss Bob Katter told reporters in a contentious press conference on Wednesday. The issue is sure to grow even more explosive both nationally and internationally after party leader Katter's press conference, where he in a fiery and confident tone further said of Anning's "magnificent speech, solid gold" speech that "90 per cent of Australia have been waiting for someone to say it and believe it." According to official government statistics, Muslims represent a small minority in Australia at just 2.6% of the population.